Raipur-Domana Mandal of BJP today organized a constituency level Karyakarta Sammelan at Nagbani in which dozens of political and social figures embraced BJP. 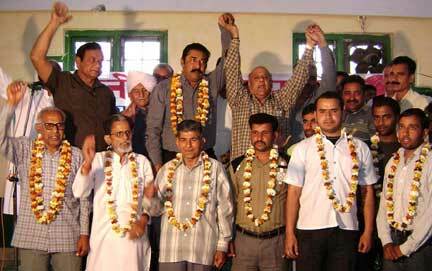 They were welcomed into the party fold by Ashok Khajuria, who was the chief guest on the occasion. Ashok Khajuria, while addressing the party activists, asked them to fan out in different parts of their mandal to expose the Congress -PDP coalition for its anti-Jammu, anti-poor, anti-Dogra, anti-youth and pro-militant policies. He said there is great resentment among the masses against the present coalition as it has no concern for the highly educated youth, government employees of all categories, including those of SRTC and clerical cadres. How unfortunate it is that the employees have not been given salaries for months together. This government has become hub of corruption and malfunctioning. The prices of food items, steel, cement and other things have touched new heights but who cares. A common man is finding it difficult to survive. Sarkaar naam ki koi cheez nahin hai-there is no government. Agar government hai to woh militants ke liye hai, rashtravaadi logon ke liye nahin.- if there is Govt. its for militants and not for nationalist people, said Ashok Khajuria and added that the Congress has only two things on top of its agenda. One is to promote dynastic rule in the country and second is to appease members of a particular faith. It is not good for the country and the nationalist forces. He asked the state CM Ghulam Nabi Azad as to why the demands of the SRTC and other employees are not fulfilled when he himself claims of bringing additional funds to the tune of crores of rupees in the state from the centre. If Ghulam Nabi Azad is to be believed, then there should not be any financial crunch. He advised the State CM not to mislead the people and meet the demands of the SRTC and clerical cadre employees immediately. He also demanded framing of a clear cut employment policy so that the highly educated youth gets jobs. BJP leaders including Ajay Jamwal, Shamsher Singh Manhas, Col. Uttam Singh, Bodh Raj, Pt. Sita Ram, Sukhdev Singh, N.D. Rajwal, Sakina Bano, Omi Khajuria, Ashok Singh and others were also present in this karyakarta sammelan.